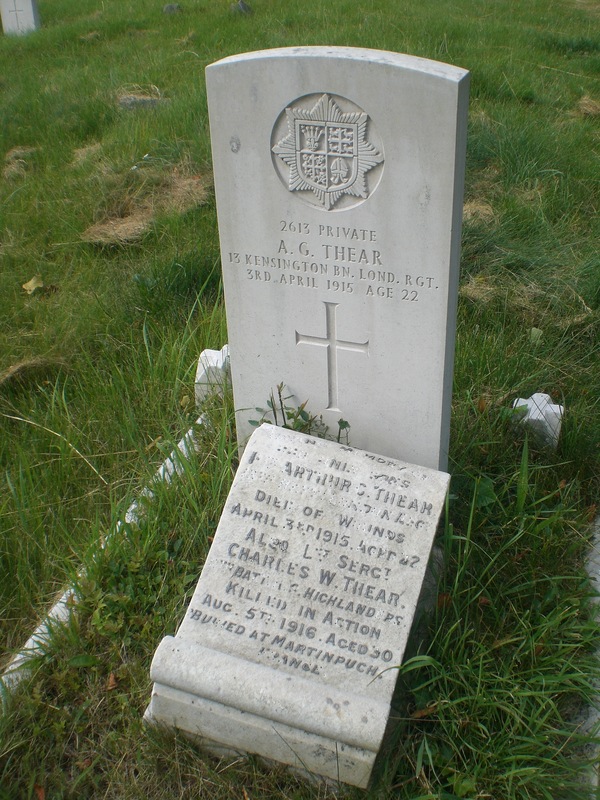 Arthur George Thear was the son of Charles and Carrie Thear, of 12, Victoria Street, Kings Road, Reading. He died of wounds and is buried in a registered war grave number 16097. His name is commemorated on the scroll headstone of the family grave. 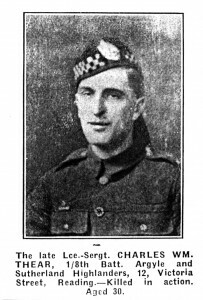 Arthur Thear joined up very soon after the war was declared but as the following newspaper article shows he had hardly been at the front any length of time before he was seriously injured. “ Private Arthur George Thear, 13th (Kensington Batt. 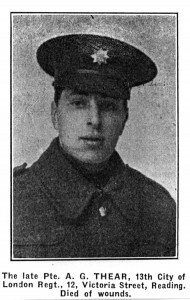 ), wounded at Neuve Chapelle, died on Saturday 3rd April at Wandsworth Hospital, and was buried on Wednesday at Reading. He was only in France two weeks before being wounded. The toes of one foot were shot off, and the other foot was altogether blown off. Previous to joining the Army he was a footman in the service of Lord Ilchester at Holland House Kensington W., and at the funeral there was a wreath from the Countess of Ilchester, besides wreaths from many of his friends. Charles William Thear was the son of Charles and Carrie Thear, of 12, Victoria Street, Kings Road, Reading. 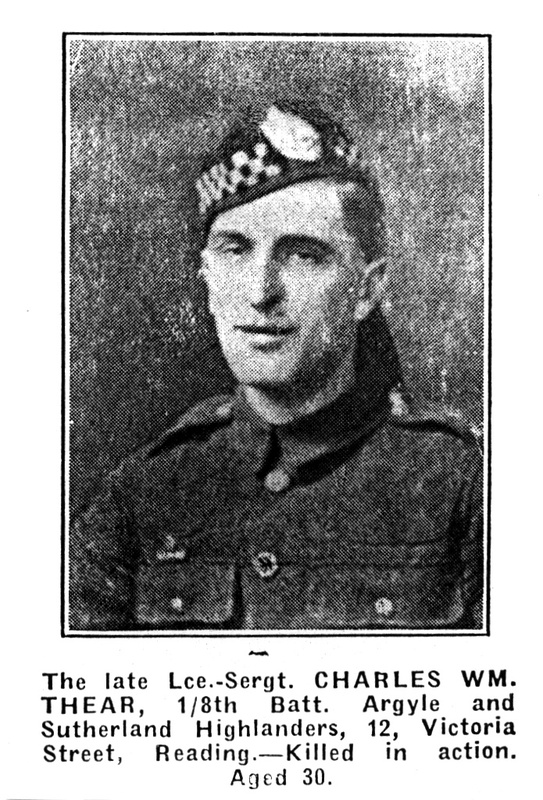 He was killed in action on 5th August 1916 aged 30. He is buried at Caterpillar Valley Cemetery, Longueval. Plot XVI. K. 10. He is commemorated on the scroll headstone of his brothers grave. The inscription on the scroll states that Charles Thear was killed in action and buried at Martinpuch. This may have been the case but after the Armistice a number of smaller cemeteries and battlefield graves were concentrated in larger cemeteries. Caterpillar Valley is such a cemetery and has been chosen by the Royal Mail to feature on one of its Millennium stamps. On August 5th 1916 the Somme battle was still raging and a particularly important objective was High Wood on the way to Martinpuch. Thousands of men died in a number of attempts to capture the wood so that they could press on the Martinpuch, situated near the Albert to Bapaume road. It was not until 15th September in a major offensive involving tanks that this objective was finally taken. Charles Thear was killed in one of the unsuccessful earlier attacks. 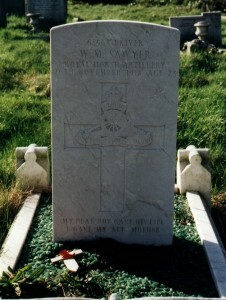 William Sawyer died on the 26th November 1918, aged 23 years, at Catterick Military hospital. There are no other details about the cause of death. William had seen 3yrs 10 months active service in France and Belgium. He was interred in the Reading Cemetery on December 6th 1918, his grave is marked with a CWGC headstone and lies near to the entrance of the cemetery in Division 2. He had a kindly word for each and died beloved by all. From his ever loving wife and family also Algy Tatsic his chum. 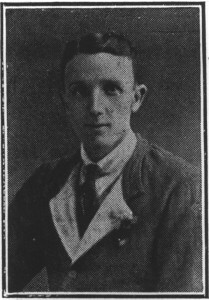 William Sawyer is also commemorated on the war memorial at Alfred Sutton School. He was a pupil at the Senior School prior to enlisting.